I became obsessed with Helen Keller when I was in grade school. At my school, every year for your birthday, you got to go to the principal's office and choose a book from a small bookshelf. And then the principal, Mrs. Webler, would put a pretty birthday sticker on the inside cover and write you a personalized note, and you were so excited to go home and read the book! One year, I picked a book about Helen Keller. (See below.) And it was so good! I still remember it vividly. It started with her birthday and she threw a serious tantrum, and then her teacher Anne Sullivan enters the picture and the world explodes and things get way better. Now that I've read Helen Keller's The Story of My Life, I can tell that the book I read as a kid was based on this autobiography. I enjoyed Helen Keller's story, though I did not realize The Story of My Life (which, from the title, sounds like it would be a COMPLETE autiobiography) only went from her childhood through early college. I was hoping it would be about her later life, when she became such a great advocate for women, the handicapped, minorities, socialism and all sorts of other causes. She was such a radical! I wanted to read all about it. I assume those parts of Keller's life come up in her other books, as they did not come up at all in this one. This makes sense, as Keller wrote The Story of My Life when she was 22, so she was obviously quite young. But the only other autobiography she wrote, The World I Live In, was written only five years later, so I am not sure if it will give me everything I want to know, either. She lived into her 80s! I thought there would be more memoirs. But perhaps I should read a biography of her by someone else instead - anyone have any recommendations? The Story of My Life is an interesting book to read even though it wasn't exactly what I expected. It gave so many great insights into Helen Keller's personality and her determination to do well. How does someone who barely remembers sound learn how to speak? It's amazing that she was able to do so, by spending hours feeling people's mouths and tongues and throats to mimic the movement and therefore make the sound. She also learned how to use a typewriter and used the typewriter for her college entrance exams and exams while in college. She would type up her answers and then someone would read them back to her and then she could make annotations or amendments at the end. It's really fascinating! It was interesting the way that Keller described things, too. She would use color imagery even though she did not know colors, because she knew that other people would understand that and the scene would come alive more for them that way. I wish she hadn't done so much of that, actually. She was so good with words, so eloquent, that I think knowing how she experienced the beach or the warmth of the sun or autumn - any of those experiences that so many of us take for granted - would have been revelatory to know about. She did go into some detail about how she prefers the country to the city because the air just feels different, and I wonder if she preferred one season to another for similar reasons. Helen Keller is one of those monumental people whom history has stripped of opinions and rough edges and made into a saint of some sort that we know more in the abstract than in the actual. Much like Johnny Appleseed and George Washington, we admire them for the vague sound bites we know of them without really understanding their personalities or motivations. By reading The Story of My Life, I got a better hint of Helen Keller's self (or, at least the self she was willing to share publicly), and I appreciate that. But it didn't give me everything I wanted to know about her, so I still need to find a more thorough lens through which to view her life. 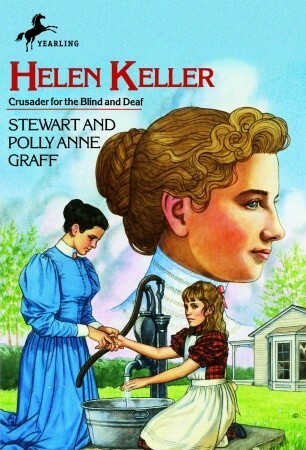 I was fascinated by Helen Keller when I was little also. I had a couple of books about her, many of which started by telling Annie Sullivan's life story and then moved on to her getting the job with Helen Keller. Keller's autobiography, I admit, bored me to death, and I was unsatisfied with it for that reason and also because, like you, I wanted to know much more about her later life. That story about Helen throwing a tantrum and then getting the feel of water blew my mind when I first read it as a child. I would love to read a biography of hers some time and probably a memoir because reading about her in her own words would be revealing as well. What a great school that gave children a book for their birthday! I wonder if that still happens anywhere. I am definitely someone who knows more about Helen Keller in the abstract then the actual- just the mention of her name makes me all impressed and kind of sad (being blind AND deaf... I cannot even) but I don't really know that much about her. So... I should probably read this book!